KABOOM is an acronym for Kids against Blowing off Our Mountaintops. The book's title gives a glimpse into the author's delicious sense of humor. Two high school girls learn that their beloved mountain is scheduled to be blown up. The coal company wants to blast the top off their mountain for easy access to the coal below. The girls work to motivate their entire school and community to save the mountain while meeting with resistance from the locals whose very livelihood depends on the mining of coal. Cyndie and Ashley are at the crossroads of womanhood and are just beginning to discover romance. Kevin, a school “hottie” and his best friend Marc (the school mascot) introduce the girls to the drama of young love. Every character is so well developed. Dad is heavily into Civil War reenactments (boring!). A beloved aunt is a little obsessed with Cheetos. An incident at one of the Civil War reenactments leads to an appreciation (even enjoyment) of the activities. Hilarious antics are at the cornerstone of this highly engaging read with an overall message of stewardship and empowerment. KABOOM is a delight to read. Teens are sure to love this book. Love, excitement, adventure, it’s all here. The humor is delightful. The book teaches environmental awareness in a non-preachy and entirely entertaining way. 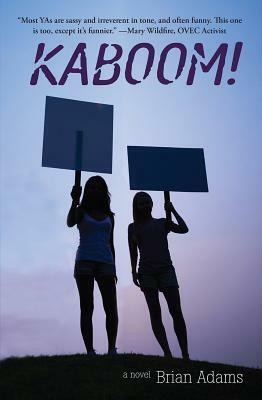 Educational and a great read, KABOOM is highly recommended and has earned the Literary Classics Seal of Approval.